An article on the Good News Big Band appeared in the Saturday, January 31, 2009 Variety section of the Minneapolis Star Tribune and here is the material from that article. The members of the Good News Big Band have almost as many reasons for joining the Christian-oriented group as there are jazz riffs. But they all agree on one incentive. They call it the wake-’em-up moment. 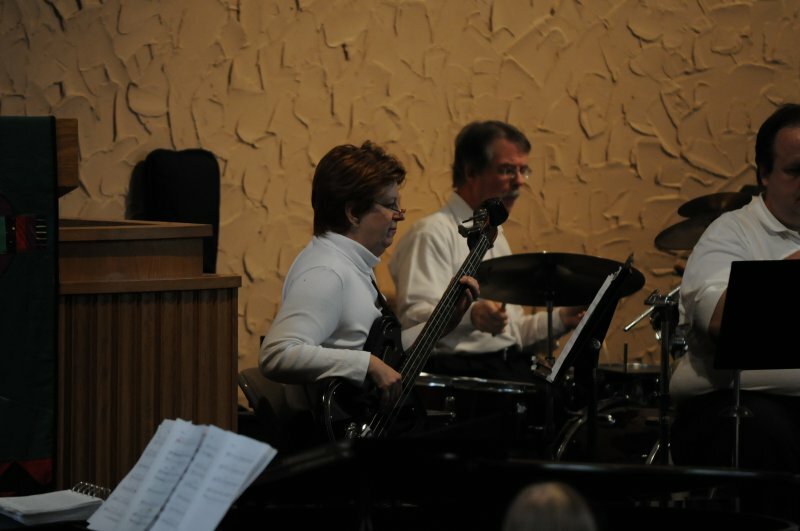 The band started in 1994 with two missions: To spread the “good news” using big-band jazz, and to have fun. Then again, they figure that they don’t have to be. The having-fun part of their mission statement comes through clearly in their weekly rehearsals. A 7 p.m. rehearsal call didn’t mean that members came drifting in then. When the clock hit 7, they all were in their chairs, ready to rip into a rousing version of “Amen,” playing through it nonstop six times so that each section got a shot at soloing. It’s addictive, said guitarist Ed Smith, a 10-year member. The ultimate proof of the enjoyment is in the band’s recruiting. Two of the members have talked their children into joining the group. Bass player Iris Bouvet’s son, J.P., fills in on drums, while pianist Allen Jackson’s daughter, Teresa, is the vocalist. It didn’t take much to convince them to join, Teresa Jackson said. When she graduated from Wheaton College last year, she jumped at the chance to sing with the group. A senior at Lakeville South High School, J.P. Bouvet admitted that big band music is not well-known among his peers. “Most of my friends probably wouldn’t recognize any of this music, but they’ve been very supportive of me doing this,” he said. The band plays both religious and secular music; in fact, they have a concert of each coming up in the next two weeks. But even when they’re working on a show of big-band standards, they remember their Christian charter. Although Richter is designated as the band leader, his duties are organizational more than musical. Any member can suggest adding a song to the band’s repertoire, and everyone is encouraged to provide input on how the numbers are played. The band makes no money. On the contrary, because they have to pay standard residual fees for the music arrangements they use, there’s the possibility of losing money on any given gig. As much as the band likes to tease congregations about waking them up, Richter tells a story about the time the tables were turned.